The Italian economy, which is the third-largest in the eurozone, contracted by a quarterly rate of 0.2 percent in the fourth quarter of 2018, the national statistics agency said. 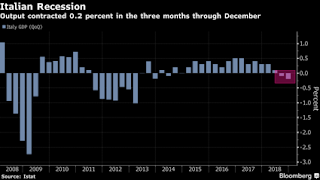 Following a 0.1 percent drop in the previous three-month period that means Italy is in a technical recession, defined as two straight quarters of economic contraction — just four years after its last one. Italy’s recession is one reason why the wider eurozone slowed in 2018, along with uncertainties related to Brexit, the China-U.S. trade spat and new vehicle emissions standards. It expanded by 1.8 percent in 2018 overall, its weakest rate in four years. That’s lower than had been anticipated a year ago, when the bloc was expected to slow only slightly from 2017’s strong 2.4 percent rate. The Italian economy has become an acute source of concern over the past few months, partly as a result of the new populist government’s spat with the European Union’s executive Commission over its budget plans, which has undermined business confidence and seen Italian borrowing rates in bond markets spike higher. Italian Premier Giuseppe Conte sought to downplay the recession and placed the blame firmly on the trade spat between the United States and China, which he says has weighed on Italian exports. “This is a transitory factor,” he told reporters in Rome.